On Wednesday, December 19, crypto-centric research firm Chainalysis released a report that only a 37% of Bitcoin addresses in its blockchain are “economically relevant”. The Chainalysis report shows that the Bitcoin blockchain network comprises a total of 460 million addresses, out of which only 172 million are relevant. These 172 million BTC addresses are “controlled by people or services who currently own bitcoin”. Again out of this 172 million, relevant addresses, only 27 million actually hold Bitcoin. The report also states that 86% of the addresses belong to the named services like the crypto exchange and the darknet market. The report also notes that “just 20% of transaction value on the Bitcoin network is an economic transfer, moving bitcoin between two different parties”. 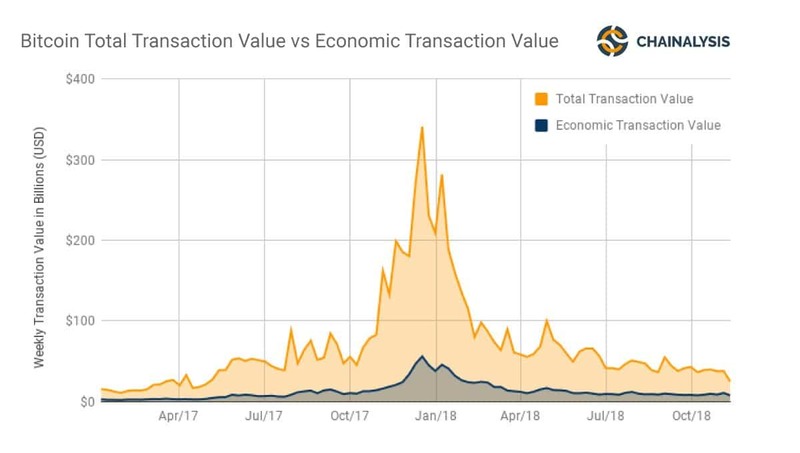 The Chainalysis report also shows the chart for the executed transactions in the period between August 2018 to October 2018. A total of $41 billion transactions were executed of which only 21.5 percent or $9 billion had real economic value. Furthermore, citing the Chainalysis report, Bloomberg reported that just before the crypto market crash in the last month of November, the amount of BTC flowing into personal wallets was on a steep rise. By November 1, the total BTC flow amount was $400 million which was 33% up from just $300 million in June. This is indicative of the fact that people were stocking more BTC tokens at the lower prices. Earlier this week, a report from Diar shows that institutional investors are moving towards the over-the-counter (OTC) physical Bitcoin markets offering higher liquidity. The report goes to mention that popular cryptocurrency exchange Coinbase saw a 20% jump in BTC trading volumes this year in 2018. The Diar report states: “Coinbase which represents only a fraction of global markets sees over 30% more trading outside of traditional exchange hours. With no time stop on trading, institutions and big money would require access around the clock from fears of a rude awakening in a market that remains highly volatile, despite that decreasing to new lows this year”. “Based on this data, over 80% of the CMC top 25 BTC pairs volume is wash traded. These exchanges continue to use these strategies as a business model to steal money from aspiring token projects”.